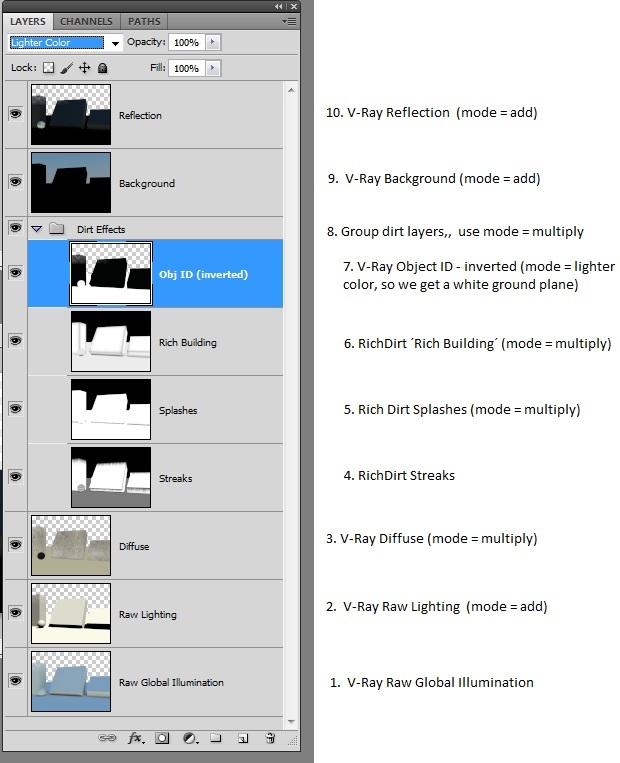 This tutorial shows how to use RenderElements created by RichDirt in Photoshop. 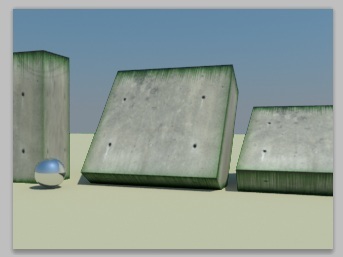 It shows the basics of compositing with Photoshop and V-Ray. 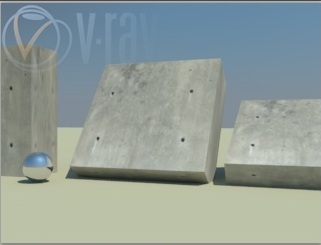 The tutorial shows how to solve 4 major hurdles in the workflow, 1 in V-Ray, 1 in 3ds Max and 2 in Photoshop. 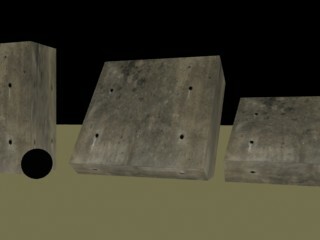 An image of our example scene - without dirt : It uses 3 concrete cubes on a floor. The size of the cubes is around 200 cm (80 inch). There is 1 mirror sphere, to cover reflections. The background uses a procedural sky. 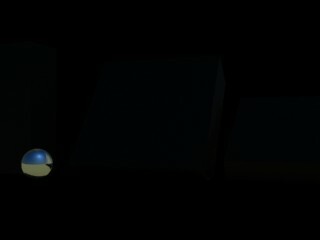 We want to separate lighting (illumination) from textures. This means we need Global Illumination (gi) also known as ´Indirect Illumination´ - without- textures. We also need Direct Illumination -without- textures. Then we also need the textures without any illumination. 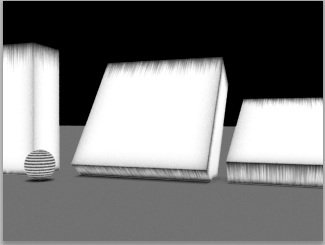 Why separating illumination from textures ? We want to change the diffuse texture later ! 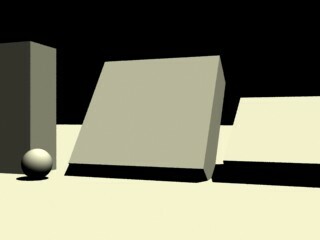 For Indirect illumination use VRayRawGlobalIllumination. Do -not- confuse this with VRayGlobalIllumination. For VRayReflection do -not- use the raw reflection (VRayRawReflection), it would be to strong. You need to export images using gamma 1.0. You need to store global illumination (gi) and direct illumination (di) as -exr-, with 32 bit per rgb. 16 bit and 8 bit would cut colors. Using jpg (8 bit) will give a wrong result in Photoshop when adding gi to di. (When adding gi + di Photoshop clips values above 1.0 (white) so a part of the illumination is dropped). When exporting .exr from 3ds Max, choose 16 bit (half float). Photoshop can handle this and shows it as 32 bit. If you export .exr as 32 bit on the Max side Photoshop pretends to be able to handle it, but it shows a broken image instead. Create a new output image, name this 'All Together' This will be used to add all layers. Set the Color 'mode' to 32 bit. 16 bit would cause trouble via color cutting. Add the diffuse image ('multiply' mode) Now we have the image reconstructed. Background (sky) and glossy reflections are missing. 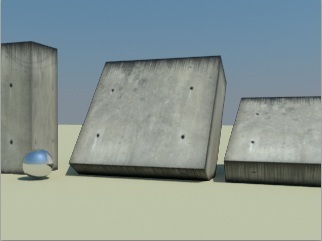 Result - we get the exact same image as inside 3ds Max. So the compositing worked ! If you get a different image, check again that you exported the images from 3ds Max using a gamma of 1.0 and used 32 bit in Photoshop. 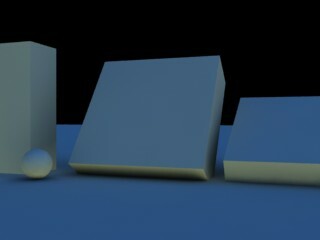 Note: the tutorial was done with a NFR version of V-Ray, which adds a watermark. 7) Create a VRayObjectId Render Element. Why to use the Object ID ? Use this to split your scene into objects that get dirt, and objects that should not get dirt. Assign an object id to the objects that you want to be dirty. The Render Element would render black on black if you do not assign object ids, by default 3ds Max doesn´t add ids. Now the Object Properties dialog is open. Enter an Object-Id to the 'G-Buffer'. You find this near the lower right corner of the dialog. Choose an object id of 65535. 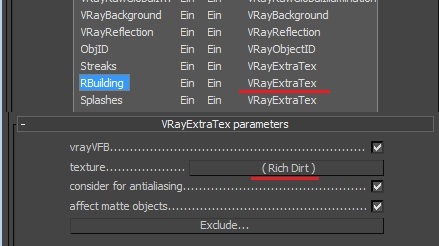 For 65535 V-Ray will render white pixels in the RE. What is the ObjectId Render element good for ? It will be used as a -mask- in Photoshop. This is very attractive and fast when you have a larger scene, like 1000 cubes, and you want dirt only added to 227 cubes. Object-ids can be assigned to all selected objects, so you can use max groups, layers, and more to quickly select objects, and then add 1 id to all of them. In your renderings you might not have a ground plane. So why is this covered so much in this tutorial ? The ground plane is an example for all geometry that you want to keep free from dirt. When you have a large model 1000s of objects might need dirt and other 1000s of objects do not want dirt. The approach described here solves this for you. main menu -> Image -> Adjustments -> Invert , or simply press ´Control-I´. Now you have an image that can be used similar to a mask..
b) Set the mode to ´Lighter Color´. Why ´Lighter color´ ? The inverted mask is white for all objects that should not get dirt. By using lighter color white will win over the medium gray ground plane, as white is ´lighter´ than gray. 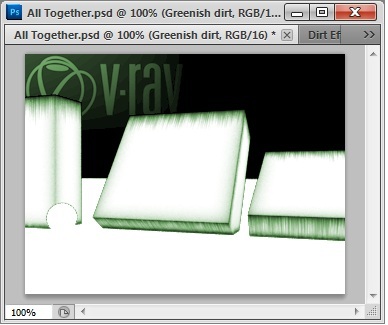 11) Now select the 3 dirt layers + the object id mask, press ´Control-G´ to create a group. Name this group ´Dirt Effects´. The object id mask must be inside the group, so it is only applied to the dirt. The huge advantage of using a group is that we can control weights (opacity) of streaks, splashes to get exactly the amount of dirt we want in our scene. This is essential to get the big speed-up compared to re-rendering. The fun part is to adjust the weights (opacity) of streaks, splashes to get the exact amount of dirt you like. Also check if your layers are still in 32 bit. When converting a single layer to 16 bit Photoshop sometimes converts all layers to 16 bit. You have indeed antialiasing on in the renderer. High quality is required here. You use 32 bit. Aliasing shows more with 16 bit. 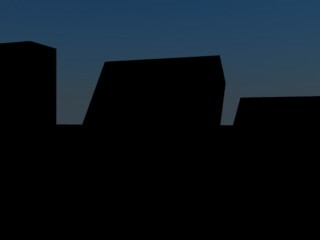 For the background (sky) there can be a gap, at pixels that are half background and half object. Using ´lighter color´ instead of ´add´ can improve this. Add a gauss filter with size 0.5 px to the inverted object id mask. This reduces most of the aliasing directly. A brute force approach to solve aliasing, if you have enough processor power, is to render in larger resolution. Do the high res compositing in Photoshop and then reduce the image size. Duplicate the Dirt Effects group. (To duplicate select the group layer, and press right mouse, then choose ´duplicate layer´). We need to duplicate it to avoid loosing it in the next step. Name this new group ´green dirt´. Once it is a smart object Photoshop allows to apply ´Rasterize Layer´. We need this (group -> smart object - > rasterize layer) because Photoshop doesn´t allow changing colors on a group of 32 bit elements. Now change the color to a greenish tone Main menu -> Image -> Adjustments -> Hue/Saturation. Choose a green color here. Switch on the ´Colorize´ toggle in the Hue/saturation dialog, so the green is visible.